Custom-Built To Fit Your Needs. If your environment has space constraints, or you would like to combine multiple products into one easily accessible unit. This is the best we have for a all-in-one unit. 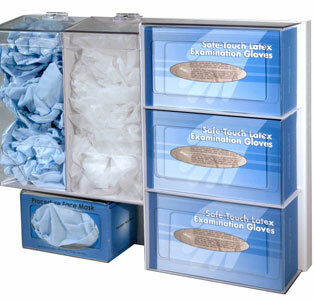 It will Hold Masks Boxes, Glove Boxes, Tissue Boxes and more We have the ability to custom fabricate your dispenser in Plastic and Metal. The Final product will be tailored to function with your enviroment.